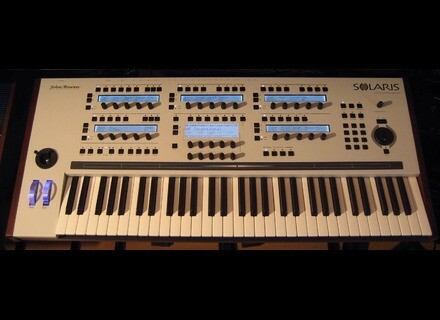 Solaris, Digital Synth from John Bowen Synth Design. kalaspace's review (This content has been automatically translated from French)"Solaris, cardboard?" as usual I put a few good and bad surprises. -no hard sync on minimoog waves, waldorf, prophet vs some mm1 whose jaws (supersaw), morphs, noise. With the Andromeda A6, it is often referenced. storage of 54 releases patches on the private forum after 1 month of use took me half a day. Given the space available 127 * 127, it is quite easy to create a monumental mess. The ability to modulate anything by anything is not everything! First must sound modules! Out, I find that this level, there is a catch. .tester every single filters, in parallel, in series, etc. .the Solaris is the "digital" / surgical synthesizer I&#39;ve ever heard in my life, the sound is straight as an arrow and as a sterile laboratory. the harmonic excitation difference is so blatant that it is highly visible spectrum and without zoom (2 * 20 seconds of sound displayed on a 27 inch)! Aurally speaking, it was more like to get burned uncomfortably as being petted by the suns rays. Unable to get a sound "vintage" at best I would speak of mindset / vintage approach, but the comparison on simple stabs, sound is ultra modern / right despite efforts / torture. the size of the modulation matrix gives more control to the sound, but this one is not good natively it does not help a lot. This symptom is typical of digital synthesizers (or vsti va) and its non-living complex modulation matrix to "compensate" the solaris going as far in this "concept" the. For this example this is explained by the use of jaws almost mandatory to have a proper beginning of "mass" instant and filters that sound better (in short the combs because the vocals are super bad Confuse). Is the anti aliasing algorithms that must currently have around with filters to round one pole? These findings are supported by the fact that ergonomics solaris enables efficient exploration, so fast, for example, assign the cutoff and resonance scanner joystick and filters, router preconfigured mixers, etc. eg sensitivity setting joystick to fly extensively or finely, etc. I am (almost) the only one with this opinion, which seem to run abreast of everything that has been written on the Internet against. Is the failure to be among those who waited to have it? attempted to obtain advice as to whether I was not missing out on something, etc. For now, no evidence was presented personally convincing me. obviously the 300 potential owners, I would say that the ladle 10 active participants. nihilise pleased that the simple rescue work fueled by a hope that one wonders whether it is from the high price of the beast or passion. astrolab's review (This content has been automatically translated from French)"Analog After All"
For technical specifications, refer to the documentation available on the website of John Bowen, through the thorough test of Synthwalker. And francophones, thank Francis AudioKeys have fully translated in French literature: a paper essential to understand all the possibilities of this magnificent machine. At my feelings, I would say that nothing is missing from this synth but I will try to develop along this notice. So there is using a pure delight. Used to be the most important information grouped under the same screen (PolyEvolver, Andromeda ...), I had to get used to the multi-vision screen. And after a week of use, the verdict is: it is an absolute pleasure! The oscillators together, the LFO also filters here, the effects there. It is said that John Bowen has certainly flattened the term "synthesizer" and brick by brick, with its incredible experience in the field, put everything in a new order. And this order - which seems strange at first use - managed a crazy gamble to rhyme with Intuitive Logic. This weekend, recreating the sounds of the Solaris Andromeda and CS-80, I had the impression of being in the kitchen and have drawers perfectly arranged with one hand utensils, other spices, spices ... It feels a blast to create a patch for all is an unstoppable clarity! For me, at the ergonomics there is only one thing missing to make it absolutely perfect and it is about the OS therefore possible (or so the feature already exists and I zapped. .): this would be the dynamic selection. Example: I select the Oscillator 1 and the other displays in which the oscillator is used one would show values: LFO, Envelope, FX, etc. ... It&#39;s not much, but the ergonomics at that time would be perfect. It could be disengaged at the OS enabled. This may be a first in any case it is definitely for me out of this synth sounds of all kinds and this without using sample (although it is possible to import samples). I speak in terms of "pure synthesis and hard!" So YES, it is possible (and this is a first for me) hope acoustic sounds very acrobatic! Although for me it&#39;s not what I&#39;m looking through the Solaris, it demonstrates its power, greater ease in nearly all soundscapes. And the rest ... Matters: pads crazy, complex layers, scalable. I even heard sounds that seem to be the domain of unpublished or rarely heard. For example, "Rotors" which allow a shape morphing between four sources of your choice (yes, live Modularity!) As four oscilloscope (but it can also be one tilt, filter, LFO .... short, madness and all delusions are allowed! Beware ears and monitors. Certain delusions can be noisy!) can quickly create ethereal sounds, unpublished unexpected. Then the number of oscillators, filters and variations available cover almost every imaginable and unimaginable ... sonic fields. This weekend (first past the Solaris), I tried to reproduce sounds from my Andromeda and my CS-80. Result this time I was no longer cook (like my earlier metaphor), but a scientist who came to encapsulate his "clone", almost 99%. Incredible. Of course, this requires some programming knowledge but also analysis (what is formed that original sound, etc ...) but Solaris is absolutely perfect for this: you sail among the real-time controllers, we tweak, we smile as close to the original sound and the pleasure is huge! We enjoy and that&#39;s rare. From my own experience, only the CS-80 and PolyEvolver bring me so much pleasure to program. But Solaris, compared to PolyEvolver and I do mean that in terms of programming, has the most significant, largely due to the presence of dedicated section for screens. The expression is very good, excellent workmanship keyboard with aftertouch impeccable, excellent response. Everything about this keyboard exudes quality. The pots, knobs, joystick (excellent), the ribbon displays with perfect legibility. And the machine is superb! Wood sides, beautiful triangular shape (rising high enough) profile which provides a good deal of clarity. So here, you&#39;ll understand that Solaris is exemplary. An instrument that we love, with whom we feel a form of complicity (like I feel with the CS-80). Because if you have a delirium in the head, a soundscape where you would get the Solaris can take you there. Of course, you must know in advance which route to take. But technically, the Solaris CAN get you there. And if the turning of (million) possibilities it offers, you get lost on the way, know admire the view anyway because it will introduce you an amazing place. The tiny flat that I could make, it&#39;s a little too academic side of the first bank of its (one just signed by John Bowen) in which I am slightly annoyed. But you can anyway not blame him: you have on hand HIS baby, a new generation of synth ("The New Frontier" by Synthwalker: can not find a better title!). Miss it more and more a Sound Designer genius admit that it would be too much for one person! Over the banks, the madness sets in and we discover the power of the beast, and - again - its versatility outsized. The possibilities seem endless and I have not even been playing around with importing samples ... Something tells me that the next few nights will be short. For 13 years, my studio is called the Solaris Studio (in honor of the Mysterious Cities of Gold of my childhood). It has never been so aptly named since the arrival of this ma-gni-fi-that instrument. I just finished acknowledging the outstanding work, exemplary, exceptional John Bowen. THANK YOU.